Need more organization but have little space? 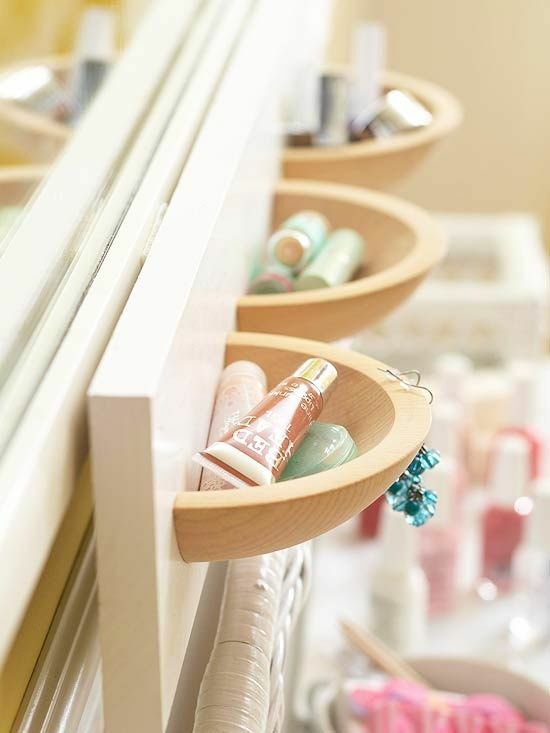 Save some room by using this quick and simple DIY organization project! First you need to cut the bowls in half, I suggest placing the bowls upside down in order to cut them. Do your best to cut them perfectly in half so that they fit on the board properly. Next, paint your wood if you haven't already. It doesn't matter if you use white or a bright color. After the paint is dried, figure out how you want the pockets placed - either in a row or staggered across the board. Make sure to measure the distance between the pockets so that they are even and look nice - I suggest marking the spots just to be on the safe side. Now all you have to do is put super glue on the back side of the bowls and attach them to the board, if you feel as if these pockets need to be secured a bit more, let the glue dry then use the short nails and hammer to nail the pockets to the wood from the back - I would do this anyway, just to be on the safe side. Once the pockets are finished, simply hang them up on a wall or whatever you want to do with them! Then use them to hold earrings, hair ties, lip gloss, hair pins, paperclips, thumb tacks, nails, screws, wing-nuts, or any other small items that you need storage for!